What are the top five skills that every nurse should develop? Nope! Not those. I imagine many of you reading automatically think about the clinical skills it takes to become a professional nurse. While clinical skills are important, they vary from specialty to specialty. As a psych nurse, I had to learn skills related to seclusion and restraint. While medical nurses do need to know about the proper and safe use of restraints, I doubt that a surgical unit has a seclusion room as part of its floor plan. Silly, right? So, no. This list is not your clinical nursing skill set. But it is a list of five skills that each and every nurse needs to be successful at nursing. 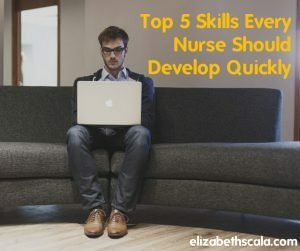 Here Are the Top Five Skills Every Nurse Should Develop… And Quickly! 1. Find Your Voice. And Use It. Just the other day, I received an email from a colleague. You ever get an email that you would consider “email yelling”? You know the drill. All caps. Bold font. Red text. And… drum roll, please. Cursing. I was offended! I felt like I was punched in the stomach. Right after anger, it turned to sadness. I felt like I wanted to cry. Then I just felt silly. Disrespected and talked down to. My goodness, and this was someone I respected. This was a person I looked up to. This was a professional colleague. You may be at work and someone talks down to you. Or they roll their eyes. Or they treat you badly. And what do you do? Likely nothing at all. Maybe you go vent to your friend. Or cry in the bathroom. You even consider quitting your job. But do you tell your boss? Do you report their behavior to upper management? Do you write them up? Do you take a stand? You are a nurse. And you went to school for a long time. You have a lot of knowledge in that brain of yours. Find your voice. And then use it. Now, I did not email my colleague back right away. In fact, I did not email back at all. Instead, I picked up the phone and spoke calmly and intelligently about the email and how it made me feel. Sometimes you need space to heal the fresh wounds. But when that time is up (and don’t let too much time lapse) speak up for yourself. When you speak up as a nurse, you speak up for the entire profession of nursing. 2. Stop Whining. And Start Taking Action. Now, I am all about open communication with your nursing leadership. And take it to the next level. Bring solutions to the table. Do your homework. Gather data. Read the nursing literature. Come prepared to meetings. There are a TON of things broken in nursing: the staffing, nurse-patient ratios, patient safety, patient satisfaction, healthcare being viewed as a business, burnout, low morale, bullying… Need I go on? No. You know the issues. Now get off your rump and go DO something about it. Be a part of the solution! 3. Grow Your Network. Even More. I have shared several posts about the importance of networking. So I will not go into the details here. The point I want to make related to the skill that every nurse should develop is network even farther than you had ever imagined before. The world is getting smaller. Healthcare is getting more and more unstable. Don’t let yourself be blindsided when your organization closes down. Or when your department needs to cut 25% of their staff and you just happen to be one of them. Bad things will happen to you as a nurse. Some of them will even be unfair. Going back to point two above, instead of falling victim to your circumstance- take action. Network online. At conferences. And outside of nursing. That’s right. Interact with providers, allied staff, non-healthcare professionals even. Grow your network far and wide so that you always have people to go to for support. 4. Trust Yourself. And Others. This is an interesting skill that nurses often overlook. Trusting in themselves and others. Let’s break this down one by one. Trusting in yourself as a nurse means trusting your gut. You know what is best for the patient. You have a feeling that something is wrong even though the monitors tell you it is all right? Nope. Trust your gut. Call that physician. Feeling nervous about making the call…. rewind. 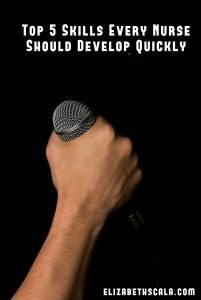 Look back up to tip #1 and find your voice. If it takes you practicing in the mirror. Do that. If it takes you role-playing with your colleagues. I am all for it. OK. So trust yourself and your nursing instinct. You have a license to protect. Which leads me to part B. Trusting others. You might be thinking as you read this post, “Elizabeth, how can I trust my colleagues when they have burned me so many times before!?!? This is my license at risk!” I hear you. And trusting others is about all of the above. It is about getting to know your colleagues. A guest on my podcast told me how she made friends with everyone in her organization. And she stressed EVERYONE. She shared an example on Your Next Shift about having lunch with one of the cleaning crew members of her department. Then, guess what? When she needed a room cleaned up quick after a discharge… guess who was there for her? The other people who work at your organization are also (for the most part) there for the patients too. In their own capacity. In how they were trained and educated. Trust that they can do a good job and build a relationship with them so that you can feel good about doing so. 5. Give To Patients. And Yourself. Yes, nurses. The nurse burnout expert is telling you that a skill you need to develop as a nurse is the ability to give to your patients. Right on. And why? Your patient is there in their most vulnerable state. They do not understand the medical jargon. They are scared. They feel anxious. They likely do not want to even be there! I know that the profession of nursing is feeling more and more like the hotel industry. Guess what? I think that is a good thing. We are there to create a healing environment for patients. We are there to tend to their needs and help them get well. We are there to provide education and support. Now, giving to the patient requires a balancing act. You can give to the patient, in a professional way. You can help a person- to the extent that they want the help and are able to receive it. And then you need to give to yourself. As a nurse, we want to fix everything. And the reason we come home feeling so weary and as though we did not make an impact… is that we also need to learn the art of letting go. When we get home, we are home. 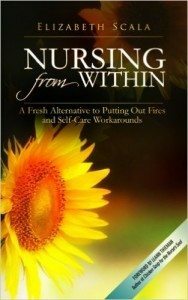 A skill that every nurse must learn is setting boundaries between work self and home self. Give to you when you are home. Do the things that you enjoy. See a funny movie. Take a walk around a lake. Sign up for a painting class. Give back to yourself. Fill yourself up so that when you are at work you can give back to the patient again. Wow. What a list! Well, would love to hear from you! What did we miss? What skill do you think every nurse should develop? And why? Leave your thoughts below and thanks for reading! They need financial literacy. Should be part of the transition to professional practice course. Good point, Susan! Thanks for adding this to the list. Great piece Elizabeth! These skills are so important with number 1, “Finding your Voice” being the catalyst for mastering the other skills.